When will my Social Security disability benefits end? You qualify for Social Security disability benefits because you have a terminal illness or a medical condition that has resulted in your permanent disability. Some Social Security disability recipients believe that because their condition is terminal or permanent that they will receive Social Security disability benefits for the rest of their life. However, this is not always true. Your health improves and you are no longer disabled. Sometimes medical conditions improve. Whether that is due to luck, medical advancements, or the natural progression of your condition, you may no longer be eligible for Social Security disability benefits if your health has improved to the point where you no longer qualify. You are able to go back to work. Even if your health condition is permanent, there may come a time when you are able to go back to work. You may find a medication that allows you to work, there could be a breakthrough in treatment for your condition, or you may find that you can work with certain accommodations. If this happens, and you are able to earn enough to engage in substantial gainful activity, then your benefits will stop. If you are unsure about whether you can earn enough to stay in the workforce or to earn enough money to qualify as engaging in substantial gainful activity then you may be able to go back to work on a trial basis until you know for sure. The exact amount that is considered substantial gainful activity is subject to change annually. In 2017, substantial gainful activity was defined as $1,170 a month for non-blind individuals and $1,950 a month for blind individuals. You reach retirement age. You cannot receive both Social Security disability and Social Security retirement benefits at the same time. Thus, the Social Security Administration will stop your disability benefits when you reach retirement age and you begin receiving retirement benefits. Before the Social Security Administration can take away your benefits, however, the agency must be aware that one of the conditions described above has occurred. How Will the Social Security Administration Know? Your report to the agency. You may need to proactively report changes of your medical condition or your work status to the Social Security Administration. The agency’s periodic review of your claim. The Social Security Administration periodically reviews all disability cases. During these reviews, the agency may decide whether or not you continue to qualify for benefits. Periodic reviews may happen as frequently as every few months or as infrequently as every seven years, depending on the unique disability that you suffer. The Social Security Administration should let you know when a periodic review is occurring and the status of the agency’s findings. However, the Social Security Administration does not always come to the right conclusion based on the information that it collects when you self-report or it conducts a periodic review. 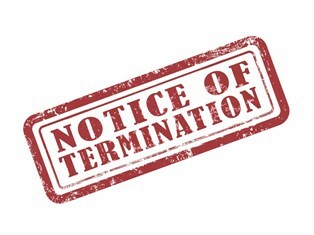 If you receive a notice of termination then it is important to take action quickly to avoid an unnecessary disruption in your disability benefit payments. While it may seem like a hassle now, it is actually easier to stop benefits from ending than to go through the entire process of applying for Social Security disability benefits again. For this reason, we encourage you to contact an experienced Social Security disability lawyer as soon as you think that your benefits may be in jeopardy. We will investigate your claim and work hard to convince the Social Security Administration of your continued eligibility if you remain disabled.